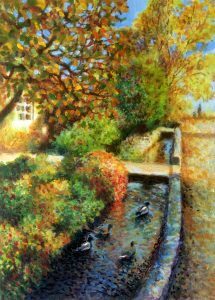 This view of the brook in my village includes ducks which are a regular feature of life here. I wanted a contrast between the right sunlight distance and the cool dark foreground with shade. The figure in the distance is deliberately left indistinct so you can make of it what you will.